Camp Kuzuma’s luxury African safari experience begins as you leave the airport. The elephants wander around outside the airport and on the side of the road between the trucks which are waiting to be loaded onto the ferry. Their presence is a teaser for what is in store for you. The camp is about an hour from Kasane airport and is discreetly camouflaged under a canopy of Mopane trees. It is as close as you can get to bush heaven. Not only is this 5 star lodge private and exclusive but you need not move further than the comfort of your armchair to watch the game either drinking at the water hole or wandering around the or some of the 196 species of birds which live there. Kuzuma means ‘hunter’ in Botswana’s indigenous language but the only shooting in the area is with a camera lens. The camp has a strong co-operation with Elephants without Borders to ensure their survival. What sets it apart, is the proximity of the elephants at the camp’s water hole in what can only be described as elephant heaven. Whether you are having an outdoor shower, sitting on the deck with a sundowner or being pampered with a back massage in the open tented spa – they are never more than a short, trumpeting charge away. Owners Stefan du Plessis and Rudy Visser, have turned a 3-hectare land concession into a five star luxury lodge and in strong co-operation with the authorities, promote ecotourism. 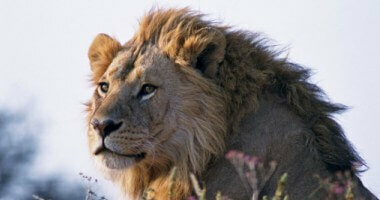 The animals are free to roam across the 11 800 hectares of traversing rights in the pristine Kuzuma Forest reserve. On the surrounding open plains of the Kuzuma Pans you can see wildebeest, buffalo, roan antelope, the very beautiful and rare sable, giraffe, lion and leopard. The rhino are however, protected in secret sanctuaries and apparently guarded more closely than the President, Ian Khama. Camp Kuzuma has five luxury open-plan tented suites, connected with an elevated walkway purportedly to give you a height advantage if you were to meet a lion passing through the camp. The canvas and stone suites are open to the bush during the day, facing the bushveld and designed for absolute privacy. Each has a sundeck and you’re in a late 19th Century time warp amongst the Victorian high backed baths, silver trays and teapots, leather couches and super king sized beds - draped with mosquito nets - as well as outdoor showers. You want for nothing and are woken in the morning by the soft footed ‘butler’ who brings a fresh pot of coffee and home baked rusks as the sun is rising. The perfect setting for a luxury bush holiday. The main lodge area is home to an open plan bar, lounge and dining area which serves sumptuous African cuisine. Our General Manager, Jaco Kok, is flamboyant and master of all trades. Kok, who has worked with renowned chefs Ainsley Herriot and Giorgio Locatelli, conjures up gourmet dishes whether it’s in the elegant dining room open to the bushveld breeze, in the boma around a fire or next to the pool on the extended deck under the stars. . The sunken fire pit just off the deck welcomes guests and offers an opportunity to find solace and comfort whilst reading a book in the cool afternoon breeze and is the informal meeting place for a nightcap and story swopping in the tranquil evenings. You are likely to hear the sound of a hyena barking or laughing, bat eared foxes in the distance or equally the sound of lion on the hunt. 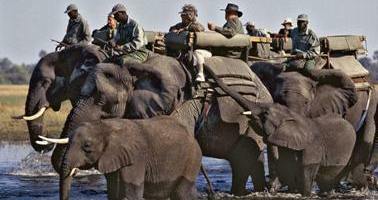 The camp has an active cooperation with Elephants conservation to ensure their survival. What sets it apart, is the closeness of the elephants at the lodge waterhole in what can only be described as elephant paradise. 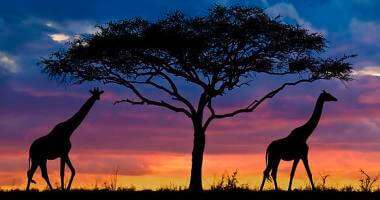 Activities at Camp include morning & evening game drives, guided walks and bird watching around the plains. The camp is 78 km away from Kasane, and an hour's drive from Kasane Airport. Airport shuttles can be arranged at a surcharge. 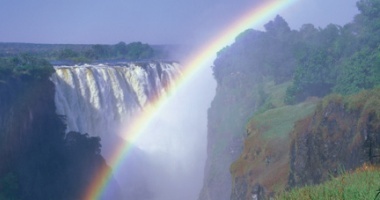 The Camp is about a 2 and bit hour drive from Victoria Falls and approximately 1 hour 20 min from the Chobe. Animals are free to roam across the 12 900 hectares of traversing rights in the natural forest filled with wildebeest, buffalo, roan antelope, the gorgeous and rare sable, giraffe, lion and leopard. Accommodation Rates: From $800 per person per night sharing. Please contact us for a quote and suggested itinerary.